I come from a long line of tea lovers. Perhaps it's my Irish ancestry, but I believe there are few problems in life a cup of tea can't solve and that tea can improve any situation. So yesterday, after sending The B Man off on another international work trip, I decided to cheer myself up with a more formal and civilized tea (even though, let's be honest, I'm still in my pjams with a scrunchie in my hair). For my birthday, I had been given a traditional Tetsubin tea set and due to my own travels, I hadn't had time to break it in yet. 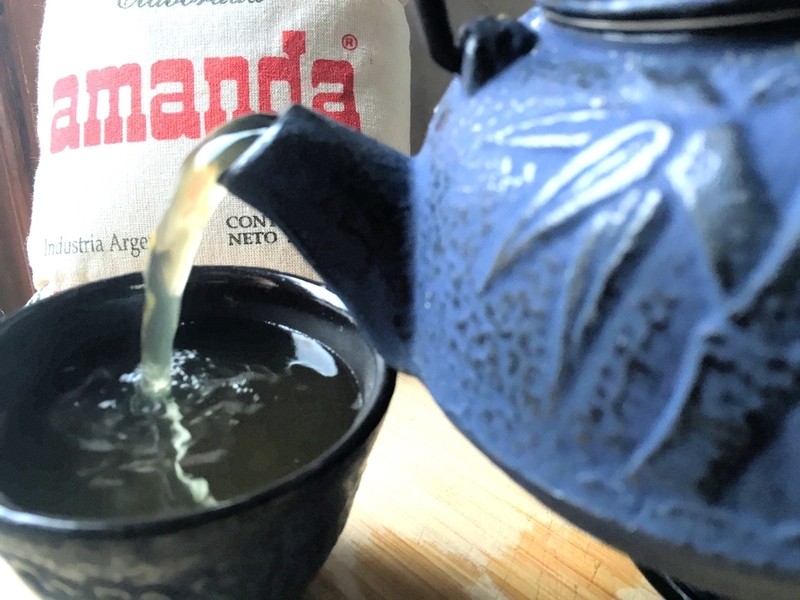 Mate, as us cool kids call it for short, is a traditional South American tea that is packed with healthy goodness, like amino acids, chromium, copper, iron, manganese, potassium, and zinc just to name a few. The caffeine in mate is also different from that of other teas and coffees so it provides a clear and focused energy instead of wired jitters. Normally one would drink mate from a gourd with a bombilla (a special straw that filters out the tea leaves and allows you to sip just the tea). I have several gourds and bombillas, but not being in the mood to go through the whole processes (and it is a bit of a process to properly pack the gourd and get the bombilla placed), I decided to be wholly American, mix some cultural traditions together, and have Japanese, South American fusion tea. So, I got out all my supplies and set to making myself a proper tea. This bag of mate is one I got on a trip to Argentina, but there are plenty of places to buy it domestically. This brand, Guayaki, can be found in most grocery stores or ordered online. And if you are new to mate, Guayaki is a great place to start since they have iced teas, tea bags, and various flavorings of the traditional drink. Mate can be a bit of an acquired taste and sometimes it's best to ease into it. The first time I tried it, I gagged and thought it tasted like dirt, but I liked the ceremony of it all and kept at it and now I've been fully addicted for like 5 years. I spooned some mate leaves into the infuser. I like my mate particularly strong, so I put quite a bit in, but it's really a matter of taste. 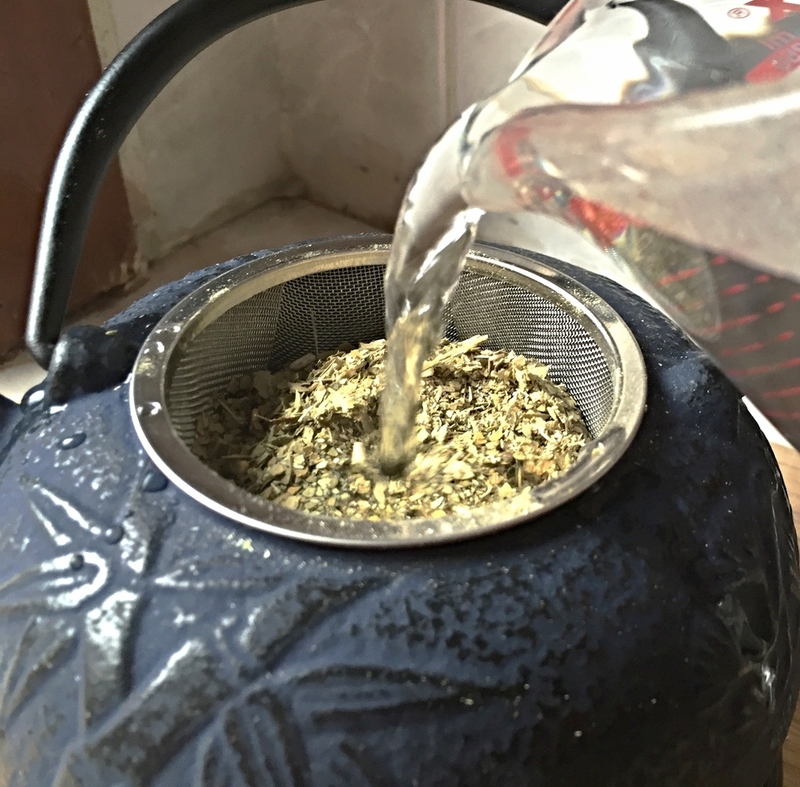 This next step is crucial with mate, and really you should do it for all teas. You'll want to pour a bit of cold water over the leaves to moisten them. This keeps the leaves from getting burned when you pour the hot water over and will prevent bitterness (in your tea, and your heart). Then you can go ahead and pour boiling water over the tea leaves. Let your tea steep for a few minutes and then pour away! So the next time you're feeling a bit blue, make yourself a proper tea. It perked me up a bit and I'm sure a hot cup of yerba mate, or any tea for that matter, would warm your heart as well!